Have you seen a bird that has caught your eye? Have you ever been curious about the birds local to San Diego? Balboa Park is home to Hundreds of native and migrant birds thanks to the varied landscapes, and mild climate. We have put together information on some of the most common birds seen around the Park. Characteristics and pictures may help you in Identifying some birds that you may encounter while visiting Balboa Park. How many can you spot? Description: Great Egrets are tall, long-legged wading birds with long, S-curved necks, long, dagger-like bills, and a wing-span of more than 4 feet. In flight, the long neck is tucked in and the legs extend far beyond the tip of the short tail. All feathers on Great Egrets are white. Their bills are yellowish-orange, and the legs black. 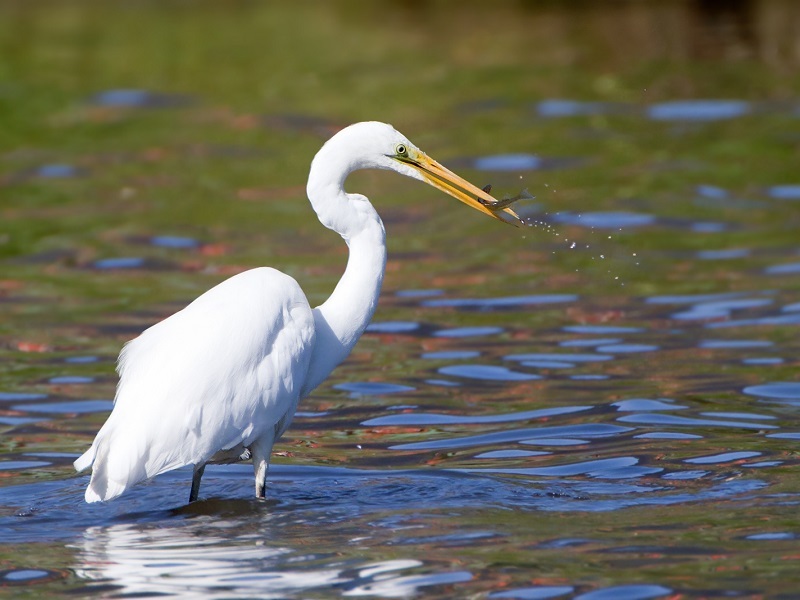 Diet and behavioral habits: Seen frequently throughout the year in Balboa Park since the late 1980’s, Great Egrets wade in shallow water (both fresh and salt) to hunt fish, frogs, and other small aquatic animals, and can often be spotted near the Lily Pond and Botanical Building. They also will catch insects like grasshoppers, and small rodents like gophers. They typically stand still and watch for unsuspecting prey to pass by. Then, with startling speed, the egrets strike with a jab of their long neck and bill. Nesting habits: Both parents will build stick nests in high trees, and also feed their young. 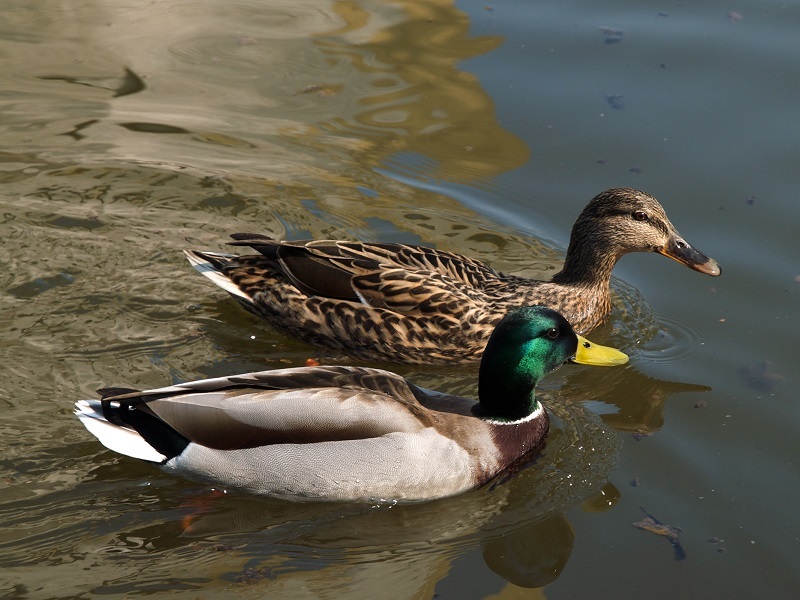 Description: Mallards are large ducks with hefty bodies, rounded heads, with wide, flat bills, and are an abundant resident of Balboa Park since the late 1980’s. Like many “dabbling ducks”, they feed in the water by tipping forward and grazing on underwater plants. They can be very tame ducks especially in city ponds, like Balboa Park’s Lily Pond, and often group together with other Mallards. Male Mallards have a dark, iridescent-green head and bright yellow bill. The gray body is sandwiched between a brown breast and black rear. 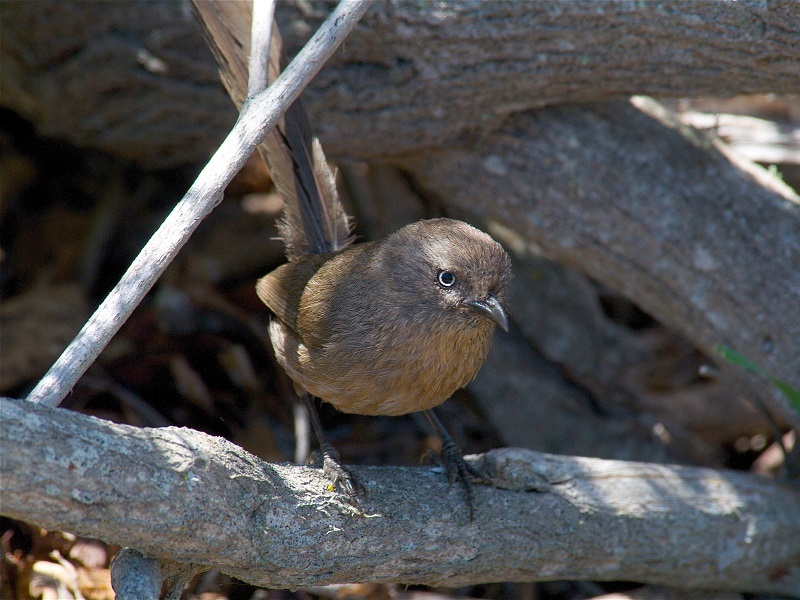 Females and juveniles are mottled brown with orange-and-brown bills. Both sexes have a white-bordered, blue “speculum” patch in the wing. Diet and behavioral habits: Mallards have a varied diet, the majority being plant material, including seeds, stems, and roots of a vast variety of different plants, especially grasses, pondweeds, as well as, acorns.. Mallards also eat insects, crustaceans, mollusks, tadpoles, frogs, earthworms, and small fish. Nesting habits: The Mallard nest usually consists of a shallow bowl of gathered plant material, lined with down, on the ground or in a tree stump, concealed by plants or trees. Young ducklings are tended to by the female, but feed themselves and eat mostly aquatic insects. Description: The Red-Shouldered Hawk is one of the most distinctively marked common hawks, with barred reddish-peachy underparts and a strongly banded tail. Diet and behavioral habits: Fairly common in Balboa Park, since the 1950’s, but more often heard than seen. One of the best ways to see Red-shouldered Hawks is to learn their distinctive whistle. Listen for these birds in and around trees and forests, where you may find them hunting from a perch, either within areas of dense trees, or in the open, swooping down when it locates prey. Sometimes they fly very low and fast, taking creatures by surprise. They may use hearing as well as sight to locate prey. 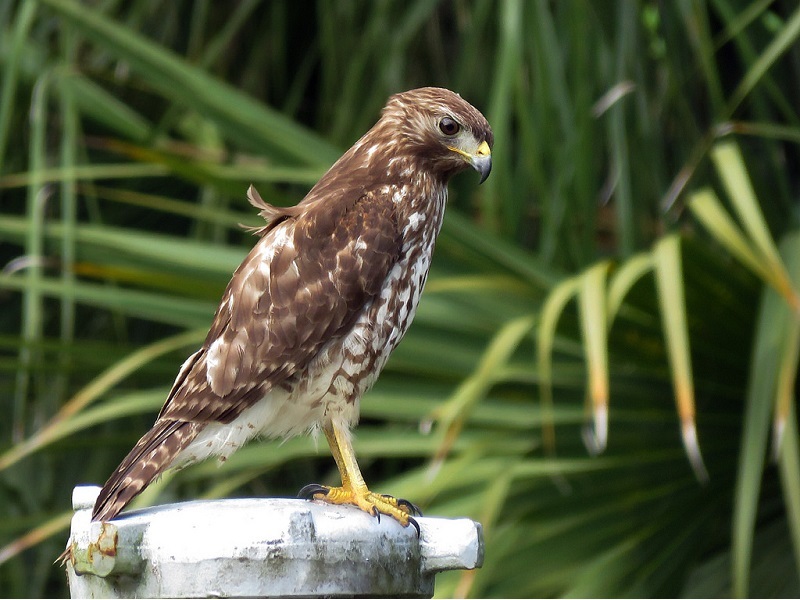 The Red-Shouldered Hawk diet includes small mammals, amphibians, reptiles, and birds, but their diet varies with region and season. Main prey is often mammals such as voles and chipmunks, at other times frogs and toads, crayfish, snakes, mice, large insects, and occasionally fish. Nesting habits: Nest are built by both sexes, and is a platform of sticks and other material, lined with bark, moss, and sprigs of green vegetation. Nest may be reused for more than one season. Description: Red-Tailed Hawk adults usually can be recognized by the trademark reddish-brown tail, the rest of their plumage can be quite variable, with local Red-tails ranging from blackish, to brown, to nearly white. Diet and behavioral habits: A common resident to Balboa Park since at least the late 1990’s, Red-Tailed Hawks are more numerous in winter, when birds from the far north arrive to join the birds that live in Balboa Park year round. This is the most widespread and familiar large hawk in North America, bulky and broad-winged, designed for effortless soaring. An inhabitant of open country, they are commonly seen perched on roadside poles or sailing over fields and tree-dense areas. 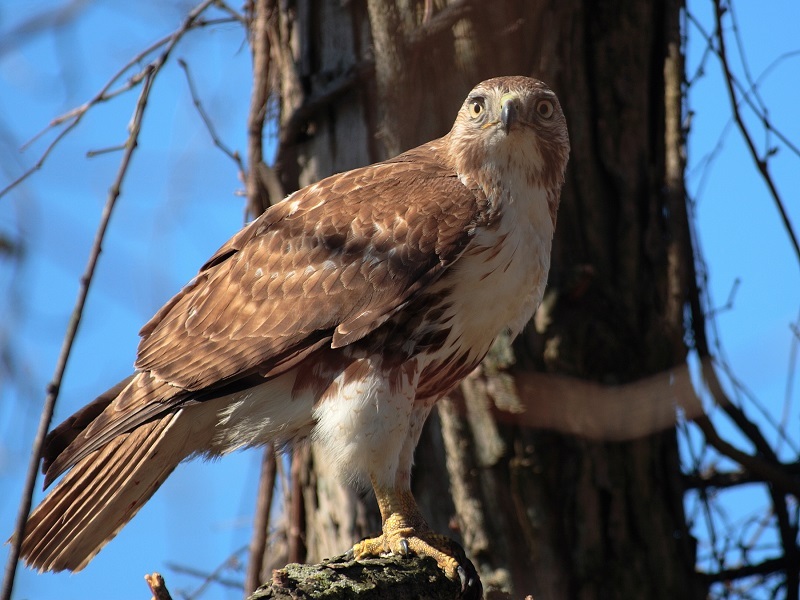 This hawk’s diet is varied, and can often be seen hunting from a high perch or in flight, searching for voles, rats, rabbits, and ground squirrels, which are their major prey, but they also eat many birds, bats, frogs, toads, insects, and reptiles, especially snakes. Nesting habits: Usually nesting in tall trees, they will also build nests on cliff ledges, among arms of giant cactus, or on artificial structures such as towers or buildings, like the Museum of Man’s California Tower. The nest (built by both sexes) a bulky bowl of sticks, lined with finer materials, often with leafy green branches added. Description: The Western Gull has a medium-gray back, dark upper surface to wingtips, frosty white undersurface to wingtips and a darkish eye. Diet and behavioral habits: A fairly common, year-round resident to Balboa Park, a large, dark-backed gull of the Pacific Coast, the Western Gull is seldom found far from the ocean, which you can see from many southern views from the Park, like Inspiration Point, and the Old Cactus Garden located near the Pan American Plaza. 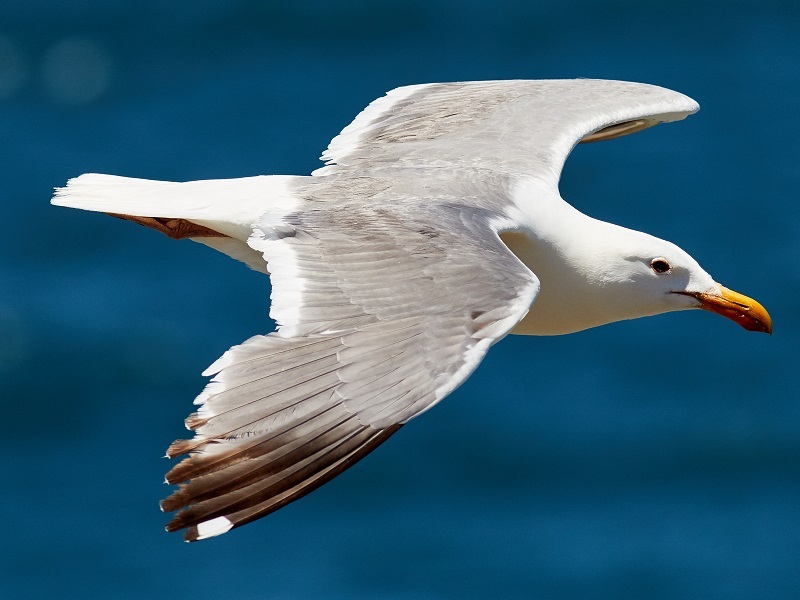 Like most gulls, the Western Gull is an opportunistic feeder, capturing its own live prey, like fish, crabs, squid, clams and the eggs or young of other birds. They are also well known for scavenging refuse, or stealing food from other birds and even humans. Feeding habits include foraging while walking or swimming, or may plunge into water from flight. Nesting habits: The nest which is probably built by both sexes, is built in a shallow depression, either on the ground, on a cliff ledge, or under overhanging rocks, and usually is lined with grass, and other plants. Description: Rock Pigeons come in many different shades, colors and patterns, with the “blue-bar” form, a bluish-gray bird with two black bands on the wing and, a black tip to the tail, being considered the most recognized form. 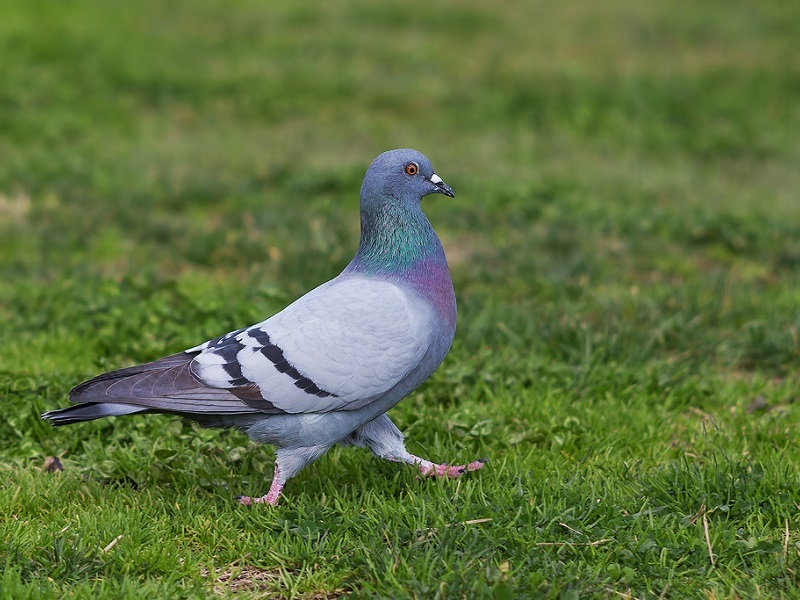 Diet and behavioral habits: Introduced to Balboa Park at the 1915 Panama-California Exposition, to create an environment similar to European public squares, the Rock Pigeon is now commonly found year-round in Balboa Park. A common sight in cities around the world, the Rock Pigeon will crowd streets and public squares in flocks, living on discarded food, and seeds. They will also forage by walking on the ground, in trees or shrubs to find berries, grass seeds, acorns, and they will occasionally eat a few earthworms or insects. Nesting habits: Rock Pigeons may mate for life and will nest on buildings and window ledges, or under bridges, and on natural cliffs. The nest is built by the female with material supplied by the male, is a platform of twigs and grass, and the same pair may use the same site again, adding to the nest each time. Description: Plump-bodied and long-tailed, with short legs, small bill, and a head that looks small in comparison to the body. 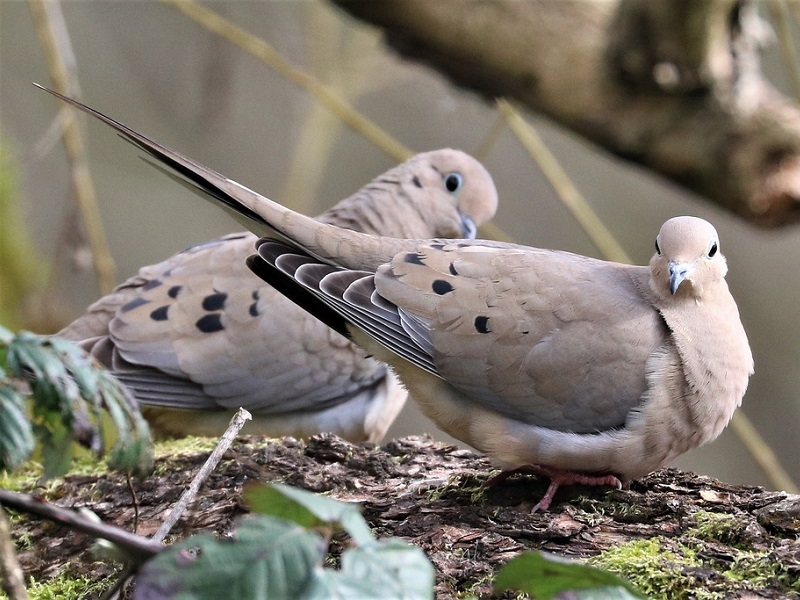 Mourning Doves often match their open-country surroundings, ranging from delicate brown to buffy-tan overall, with black spots on the wings and black-bordered white tips to the tail feathers. Diet and behavioral habits: A graceful, slender-tailed, small-headed dove that’s common year-round resident to Balboa Park, but was seen in greater numbers in the late 1990’s. Mourning Doves perch on telephone wires and forage for seeds on the ground; their flight is fast and bullet straight. Their soft, drawn-out calls sound like laments. The Mourning Dove’s diets consists almost entirely on seeds of grasses, ragweeds, many other plants and will occasionally eats snails, but very rarely any insects. Mourning Doves eat roughly 12 to 20 percent of their body weight per day. Nesting habits: Nests are built by the female, with sticks and twigs brought by the male, after the female selects a nesting site from a selection picked by the male. Nesting sites for the Mourning Dove are typically in a tree or shrub, on the ground, or on a building ledge or other structure. Description: The Great-Horned Owl are large, thick-bodied owls with two prominent feathered tufts on the head, with wings that are broad and rounded. They are mottled gray-brown, with reddish brown faces and a neat white patch on the throat. Diet and behavioral habits: A year-round resident of Balboa Park, look for this widespread owl in wooded areas, particularly near fields or other open areas, like the West side of the Cabrillo Bridge. Great Horned Owls are nocturnal, and you may see them at dusk sitting on fence posts or tree limbs at the edges of open areas, or flying across roads or fields with stiff, deep beats of their rounded wings. Their call is a deep, stuttering series of four to five hoots A powerful carnivore, Great Horned Owls have been known to hunt rabbits, hawks, snakes, and even skunks. 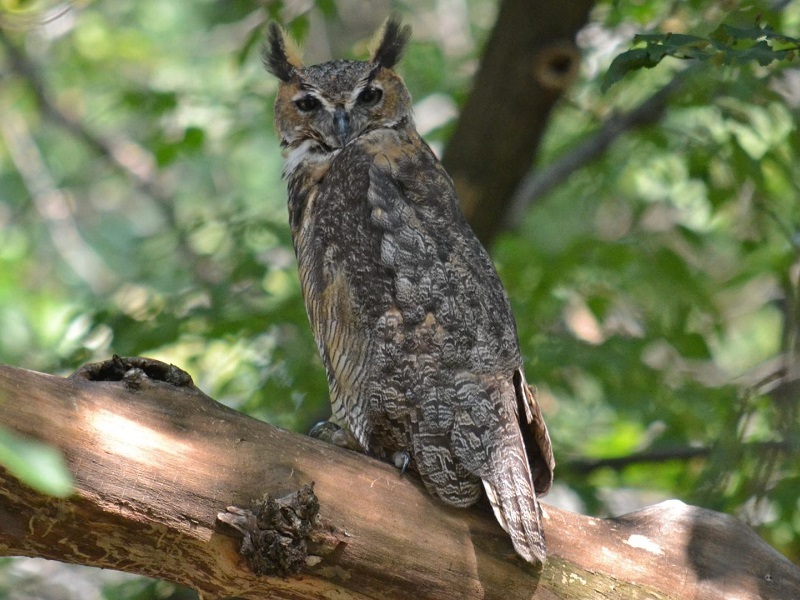 Nesting habits: Great Horned Owls will often use old nests of other large bird, such as hawk, eagle, crow, or heron, and they are usually 20-60' above ground. These Owls will add little or no new nest material to the existing nest, aside from feathers. Description: A small bird, dark gray-brown with long, pointed, swept-back wings. Nesting habits: The Vaux’s Swift nest site is usually inside hollow tree, reached via broken-off top or woodpecker hole. They may nest as solitary pairs or in colonies. The nest itself is made by both sexes, and the nest material is obtained by breaking off small twigs from trees while flying. Twigs are carried in mouth to nest site, cemented into place with sticky saliva. The nest is a shallow half cup glued to inside wall of tree. 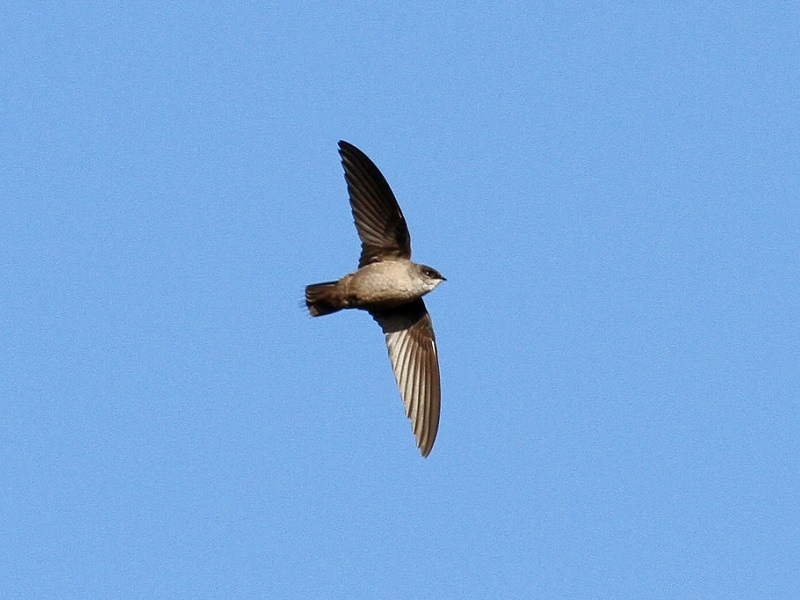 Description: White-Throated Swift are small, with a black back, wings, and tail, a white throat, belly, and sides behind the wings. They have a cylindrical body, with long, pointed, swept back wings. 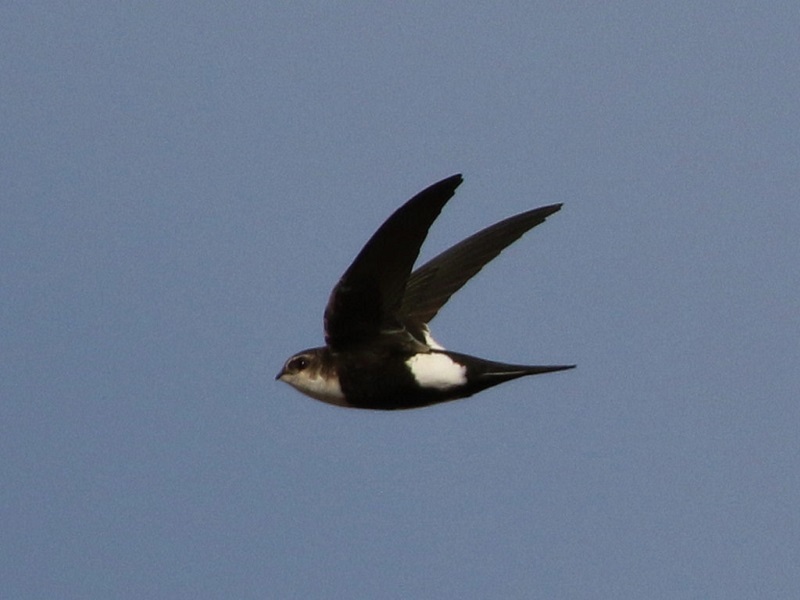 Diet and behavioral habits: A fairly common year-round resident, the White-throated Swift is seen all around Balboa Park from the Cabrillo Bridge to the Florida Canyon, since the 1940’s. They are very social birds, often sleeping in roosts of hundreds of birds. Feeding on a wide variety of flying insects, including flies, beetles, true bugs, wasps, and on winged adult ants. Nesting habits: Many details of nesting remain poorly known, partly because the nest sites are so inaccessible. The nest site of the White-Throated Swift is usually in narrow vertical crevice in buildings or cliffs. Nesting sites may be used for many years. The nest itself is shaped like shallow half saucer; made of feathers, weeds, grasses, glued together and to wall of crevice with the birds' saliva. Description: Tiny among birds, Anna’s are medium-sized and stocky for a hummingbird. They have a straight, short, bill and a fairly broad tail. When perched, the tail extends beyond the wingtips. 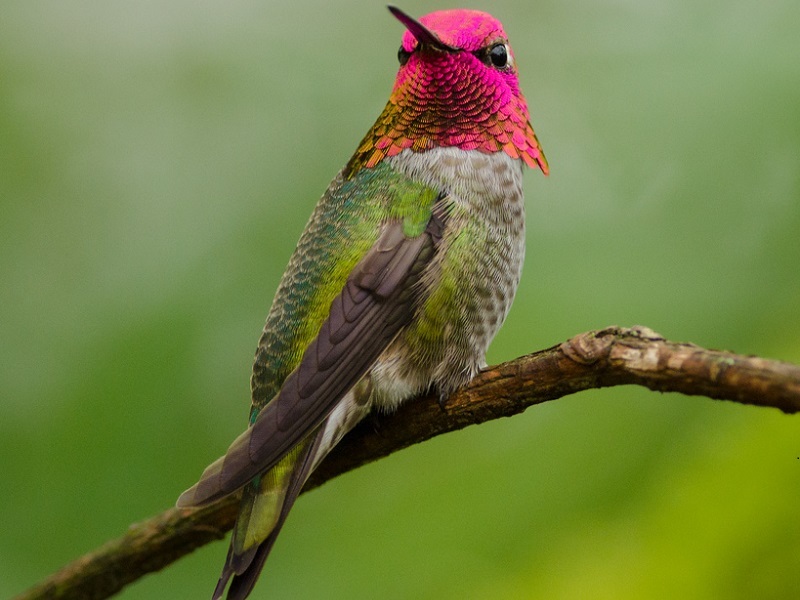 Anna’s Hummingbirds are mostly green and gray, and the male's head and throat are covered in iridescent reddish-pink feathers that can look dull brown or gray without direct sunlight. Diet and behavioral habits: A very common site in Balboa Park, all year round, Anna’s Hummingbirds are common in yards, parks, residential streets, eucalyptus groves, riverside woods, savannahs, and coastal scrub. Anna’s Hummingbirds are a blur of motion as they hover before flowers looking for nectar and insects. Listen for the male's scratchy metallic song and look for him perched above head level in trees and shrubs. Nesting habits: Nesting sites are variable, on a branch of tree or shrub, sometimes in vines, on wires, under eaves, and 4-25 feet above ground. The nest is built by the female, and is a compact cup of plant fibers and spider webs, lined with plant down and sometimes feathers, with the outside camouflaged with lichens. Description: A small woodpecker with a chisel-shaped bill they have a small rounded head, a flat back, and an elongated appearance, and are black-and-white striped birds. Males have a red patch on the back of their heads and both sexes have 2 narrow white stripes across their cheeks. The back has narrow black-and-white horizontal bars with a solid black patch on the upper back. The underparts are whitish with spotting and barring on the flanks. Juveniles have more grayish or buffy underparts than adults, and juveniles of both sexes have some red on the crown. Diet and behavioral habits: A common, year-round resident, Nuttall's Woodpeckers have increased in numbers in Balboa Park since 1984. They frequent wooded suburban areas and woodlands near streams with cottonwoods, willows, and sycamores. Nuttall's Woodpeckers probe and pick insects out of crevices in tree trunks, branches, and twigs. They feed on a wide variety of insects, especially beetles, also caterpillars, ants, true bugs, but will also eat some nuts, seeds, fruits, berries. Nesting habits: Their nest site is usually a cavity in live or dead tree, usually cottonwood, willow, or sycamore near oak woods, sometimes in utility pole, fence post, or oak or other tree. Cavity usually 3-35' above ground, sometimes up to 60' or higher. Male does most of excavating, and will create a new nest cavity every year. Members of pair may remain more or less together all year. Description: Black Phoebes are small, plump songbirds with large heads and medium-long, squared tails. They often show a slight peak at the rear of the crown. The bill is straight and thin Black Phoebes are mostly sooty gray on the upperparts and chest, with a slightly darker black head. The belly is clean white, and the wing feathers are edged with pale gray. 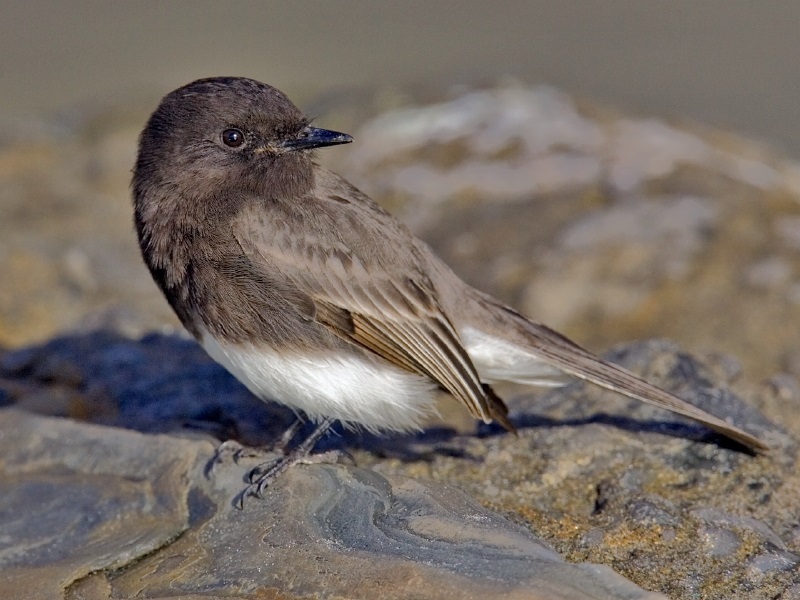 Diet and behavioral habits: A common resident, to Balboa Park, dating back to the 1920’s, the Black Phoebe live along streams, rivers, lakes, and the Pacific Ocean. The Black Phoebe’s diet consists almost entirely of insects, including beetles, grasshoppers, crickets, wild bees, wasps, flies, moths, caterpillars, and they will occasionally eat small fish. Nesting habits: Mud nests, which are probably built by the female, are usually plastered to sheltered spot such as cliff face, bridge support, culvert, or under eaves of buildings. The nest itself is an open cup, and is made of mud mixed with grass and weeds, lined with soft materials such as plant fibers, rootlets, or hair. Description: A medium-sized songbird, this Kingbird has a gray head and chest, a yellow on the belly and under the tail, with a black square tail, with white tip. Diet and behavioral habits: They eat mostly insects, including wasps, beetles, caterpillars, moths, grasshoppers, true bugs, flies, and many others, as well as some spiders. It also may eat some berries and fruits, more than most flycatchers. 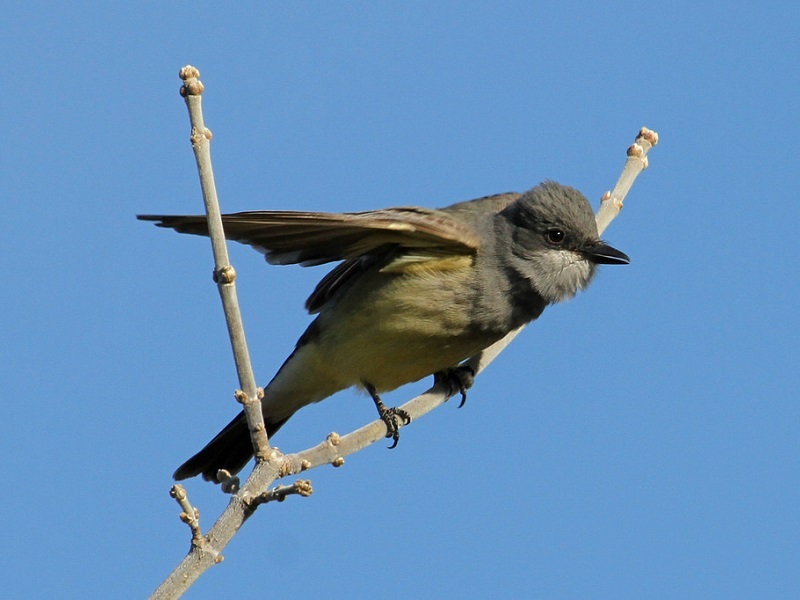 A common year round resident to Balboa Park, since the late 1980’s, the Cassin’s Kingbird prefers semi-open, wooded areas, with pine and oak groves. Nesting habits: Their nest site is in a large tree such as sycamore, cottonwood, oak, or pine, placed on a horizontal or near-horizontal branch, often well out from the trunk. Usually 20-50' above the ground. The nest is a bulky cup of twigs, weed stems, rootlets, leaves, feathers, hair, and debris, lined with finer plant fibers and other material. 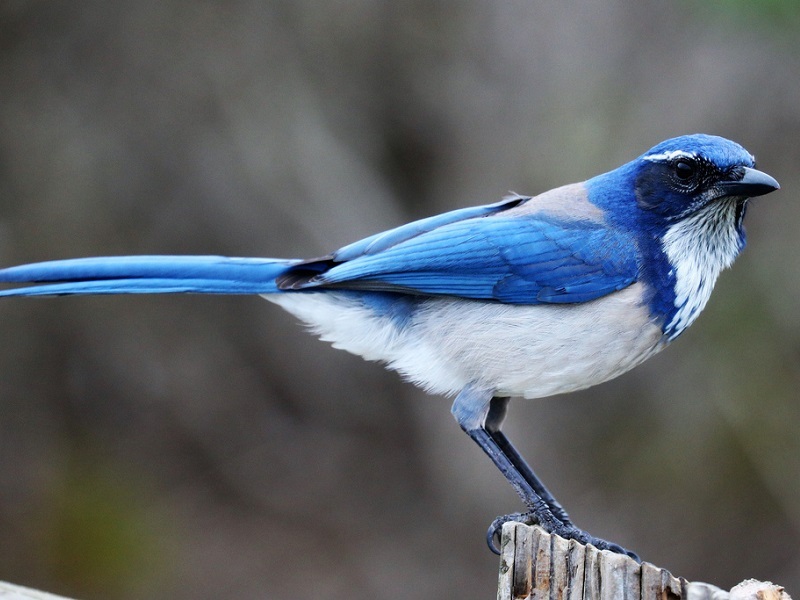 Description: The California Scrub Jay is a fairly large songbird with lanky dimensions. The tail is long and floppy; the bird often adopts a hunched-over posture. The bill is straight and stout, with a hook at the tip Rich azure blue and gray above, with a clean, pale underside broken up by a blue necklace. In birds, the color blue depends on lighting, so California Scrub-Jays can also look simply dark. Diet and behavioral habits: A fairly common resident, since 1980, look for California Scrub-Jays in open habitats, like that of the West Mesa of Balboa Park. Assertive, vocal, and inquisitive, you’ll often notice scrub-jays silhouetted high in trees, on wires, or on posts where they act as lookouts. Scrub Jays are omnivorous and their diet varies by season. They eat a variety of insects in summer as well as, a few spiders and snails. Their winter diet may be mostly acorns and other seeds, nuts, and berries. They will also eat rodents, eggs and young of other birds, and small reptiles and amphibians. Nesting habits: Unlike some other Jays, this species breeds in isolated pairs, and stay together all year. Nest site is in a shrub or tree, 5-15’ above the ground, but sometimes higher. The nest, built by both sexes, is a well-built, thick-walled cup of twigs and grass, lined with rootlets and sometimes with animal hair. Description: A large, long-legged, thick-necked bird with a heavy, straight bill. In flight, the wings are fairly broad and rounded with the wingtip feathers spread like fingers. The short tail is rounded or squared off at the end. American Crows are all black, even the legs and bill. Diet and behavioral habits: After becoming established in Balboa Park in the late 1980’s, they are an abundant resident. American Crows are very social, sometimes forming flocks in the thousands. Inquisitive and sometimes mischievous, crows are good learners and problem-solvers, often raiding garbage cans and picking over discarded food containers. 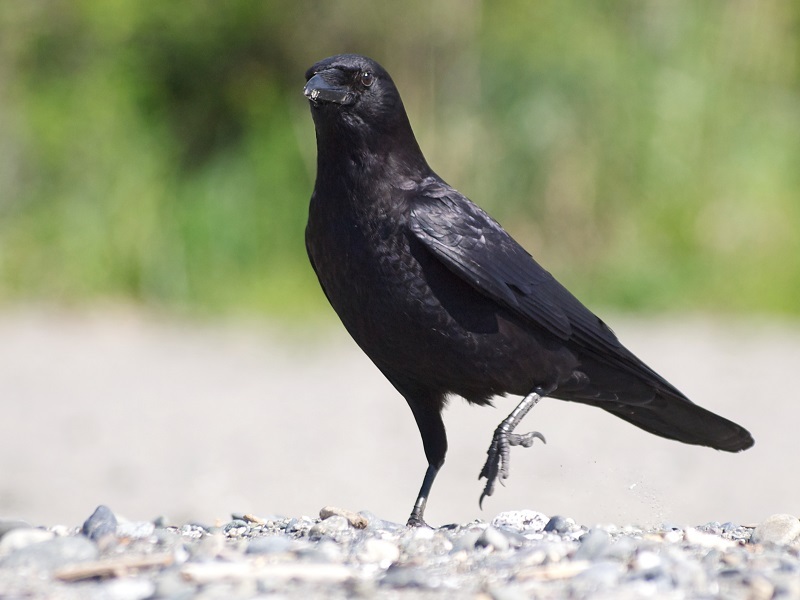 The American Crow is omnivorous, and seems to feed on practically anything it can find, including insects, spiders, snails, earthworms, frogs, small snakes, shellfish, carrion, garbage, eggs, and young of other birds, seeds, grain, berries, fruit. Nesting habits: The American Crow’s nest site is in tree or large shrub, 10-70' above the ground, usually in vertical fork or at base of branch against trunk.The nest, built by both sexes, is a large bulky basket of sticks, twigs, bark strips, weeds, and mud, lined with softer material such as grass, moss, plant fibers, and feathers. Description: Not just large “songbirds,” with a thick neck, shaggy throat feathers, and a sharp beak. They're more slender than crows, with longer, narrower wings, and longer, thinner “fingers” at the wingtips. Common Ravens are entirely black, right down to the legs, eyes, and beak. Diet and behavioral habits: A fairly common resident, Common Ravens aren’t as social as crows; you tend to see them alone or in pairs except at food sources like landfills. Ravens are confident, inquisitive birds that strut around or occasionally bound forward with light, two-footed hops. Common Ravens are omnivorous, but the majority of diet is animal matter, including a wide variety of insects, including beetles, caterpillars, and others; also rodents, lizards, frogs, and eggs and young of other birds. They also regularly eat carrion and garbage. 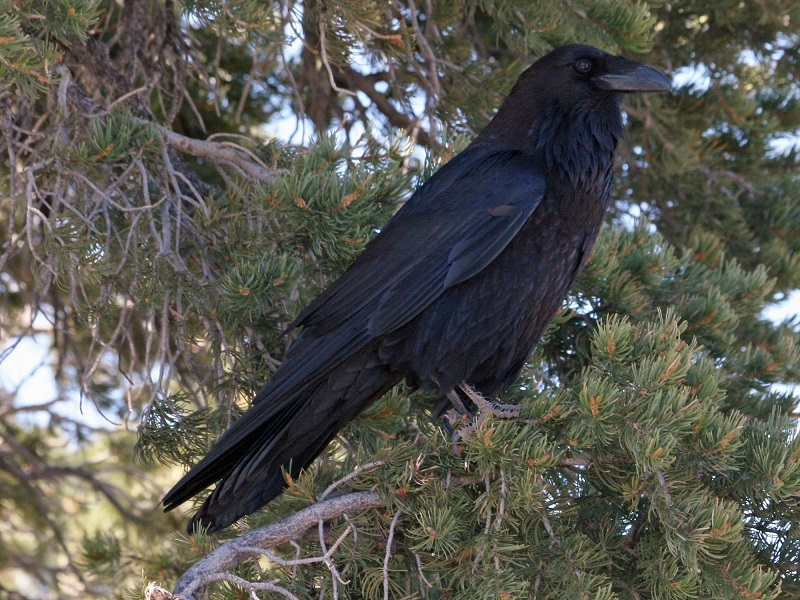 Nesting habits: The Common Raven’s nest site is usually on ledge of rock cliff, or high in tall tree (especially conifer). They may use same site year after year, adding material on top of the old nest that both sexes help build. The nest is a bulky basket of large sticks and twigs, with deep depression in center lined with grass, bark strips, moss, or animal hair. Description: Western Bluebirds are small thrushes that perch upright. They are stocky with thin, straight bills and fairly short tails. Male Western Bluebirds are shiny blue above with rust-orange extending from a vest on the breast onto the upper back. Females are gray-buff with a pale orange wash on the breast and blue tints to the wings and tail. The throat is blue in males and gray-buff in females, and the lower belly is whitish. 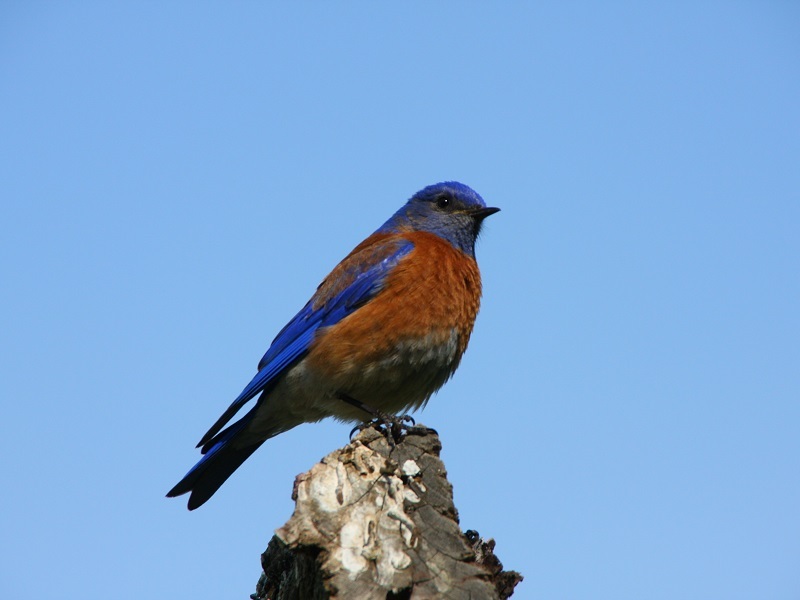 Diet and behavioral habits: Seen in Balboa Park since the 1920’s, the Western Bluebird is now a year-round resident. These birds are social, and feed in flocks during the non-breeding season. Western Bluebirds rely on trees both for nesting cavities and hunting perches. Insects make up majority of diet, especially in summer; feeds heavily on grasshoppers, caterpillars, beetles, ants. and also many other insects. Berries and small fruits are important in diet especially in winter, including the fruits of mistletoe, juniper, and elderberry. 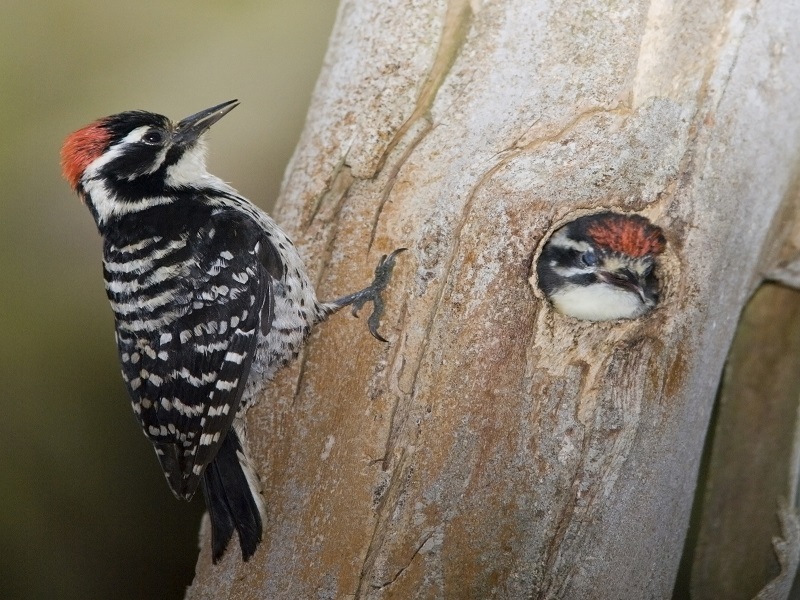 Nesting behavior: The nest site is in a cavity, such as natural hollow in oak or pine, old woodpecker hole, birdhouse, or sometimes a hole in a building. They usually nest fairly low, rarely up to 50' above the ground. The nest is probably built mostly by female, but male may take part. The nest is made up of a rather loose cup of twigs and weeds, lined with finer grass. Description: Starlings are chunky and blackbird-sized, but with short tails and long, slender beaks. In flight their wings are short and pointed, making them look rather like small, four-pointed stars (and giving them their name). At a distance, starlings look black. In summer they are purplish-green iridescent with yellow beaks; in fresh winter plumage they are brown, covered in brilliant white spots. Diet and behavioral habits: Once abundant in Balboa Park, their numbers have diminished since the turn of the century, but they are still considered a fairly common resident. 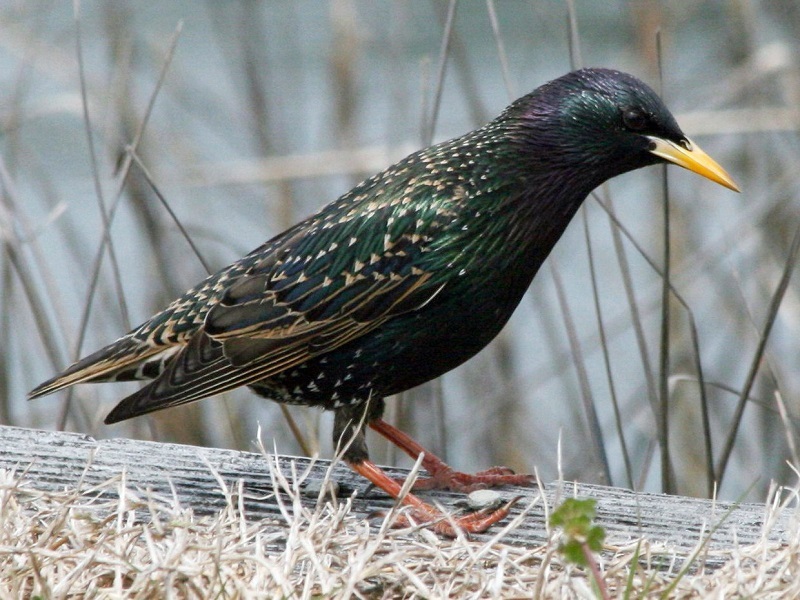 Starlings are boisterous, loud, and they travel in large groups. Their diet consists mostly of insects especially beetles, grasshoppers, flies, and caterpillars, also spiders, snails, earthworms, and other invertebrates. In fall and winter, they will eat a wide variety of berries, fruits, and seeds and sometimes visits flowers for nectar. Nesting habits: The Starling’s nest site is in any kind of cavity; usually in natural hollow or woodpecker hole in tree, in a birdhouse, or hole in giant cactus. Sometimes even in holes or crevices in buildings or other odd spots. Nest construction is begun by the male, is often completed by the female. Nest is a loose mass of twigs, weeds, grass, leaves, trash, feathers, with slight depression for eggs. Description: This medium-sized songbird has a long, thin bill with a hint of a downward curve, and long legs. 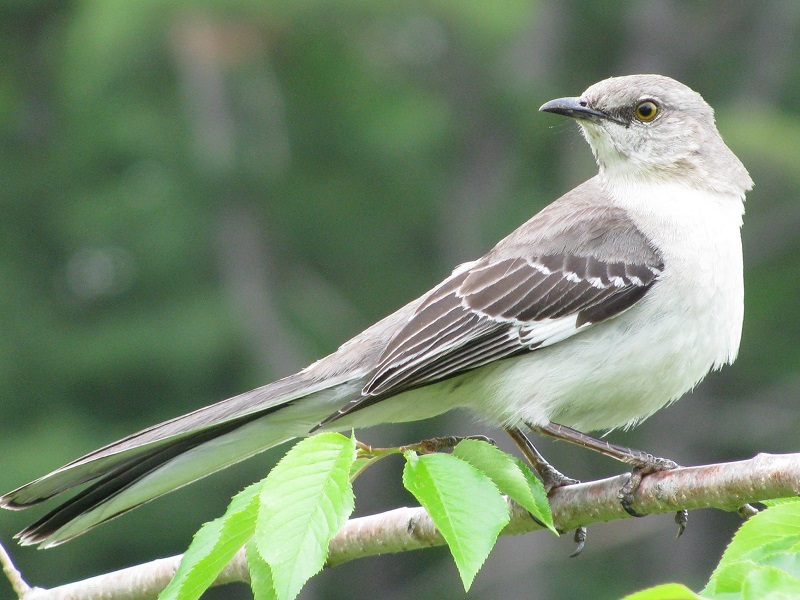 Their wings are short, rounded, and broad, making the tail seem particularly long in flight, Mockingbirds are overall gray-brown, paler on the breast and belly, with two white wingbars on each wing. A white patch in each wing is often visible on perched birds, and in flight these become large white flashes. Diet and behavioral habits: These birds are common year round in Balboa Park, but numbers have declined since the turn of the century. They feed heavily on insects in late spring and summer, especially beetles, grasshoppers, caterpillars, ants, wasps, and others including spiders, snails, sowbugs, earthworms, and rarely crayfish and small lizards. Fall and winter diet leans heavily to berries, wild fruits, and a few cultivated fruits. Nesting habits: Nesting begins early, by late winter in southern areas. The nest is built in a dense shrub or tree, usually 3-10' above the ground, sometimes lower or higher (rarely up to 60'). Nest has bulky foundation of twigs supporting open cup of weeds, grass, leaves, lined with fine material such as rootlets, moss, animal hair, plant down. The male builds most of foundation, and the female adds most of lining. Description: The California Thrasher is a large, long-tailed songbird, with a long, down-curved beak. Grayish brown all over, they sometimes have a reddish brown underside, The California Thrasher is the largest of the thrashers. Diet and behavioral habits: Fairly common year-round, the California Thrasher only found in California and Baja California. In Balboa Park, they can be seen in coastal sage scrub, and Chaparral within Florida canyon. Their diet is a wide variety of insects, including ants, wasps, bees, beetles, caterpillars, moths, and many others, along with some spiders and centipedes. Berries and small fruits are important in diet, and will eats seeds, acorns, and other plant material. Nesting habits: The nest is placed in a dense shrub or extensive thickets, less than 10' above the ground, usually 2-4' up. Nest (built by both sexes) is a bulky open cup of sticks and twigs, lined with fine grass, weeds, rootlets, strips of bark, and other soft items. 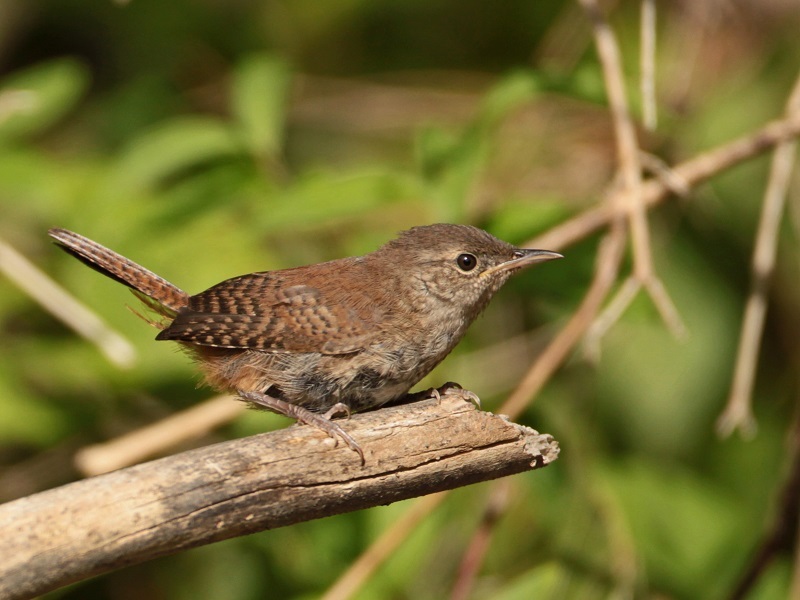 Description: Bewick’s Wrens are medium-sized wrens with a slender body and a strikingly long tail often held upright. They have slender, long bills that are slightly downcurved, They are brown-and-gray, with a long, brow-like white stripe over the eye. The back and wings are plain brown; underparts gray-white; and the long tail is barred with black and tipped with white spots. Nesting habits: The nest site is in any kind of cavity, including natural hollows in trees, old woodpecker holes, and man-made sites, including nest boxes, holes in buildings, mailboxes, tin cans, and others. Site is usually less than 20' above the ground. Male may build incomplete "dummy" nests, and the female probably chooses site and completes one nest for raising young. Nest has a foundation of twigs, leaves, bark strips, and trash, topped with a softer cup of moss, leaves, animal hair, feathers, and sometimes, bits of snakeskin. Description: Small and compact, with a flat head and fairly long, curved beak. Short-winged, often keeping its longish tail either cocked above the line of the body or slightly drooped. Subdued brown overall with darker barring on the wings and tail. The pale eyebrow that is characteristic of so many wren species is much fainter in House Wrens. Diet and behavioral habits: Occasionally seen over most of the 20th century, the species has become fairly common year-round. Bubbly and energetic, just like their songs, look for House Wrens hopping quickly through tangles and low branches and, in spring and summer, frequently pausing to deliver cheerful trilling songs, Feeds on a wide variety of insects, including beetles, true bugs, grasshoppers, crickets, caterpillars, moths, flies, spiders, plus some millipedes and snails. Nesting habits: Nest site is in any kind of cavity, including natural hollows in trees and stumps, old woodpecker holes, crevices in buildings, in nest boxes, or almost any kind of enclosed space (flowerpots, parked cars, shoes, drainpipes, etc.). Nest site is usually low, but may be high in trees. Male builds incomplete "dummy" nests in several cavities; female chooses one and finishes nest by adding lining. Nest has a foundation of twigs, topped with softer cup of plant fibers, grass, weeds, animal hair, and feathers. Description: Bushtits are tiny, kinglet-sized birds. They are plump and large-headed, with long tails and short, stubby bills. 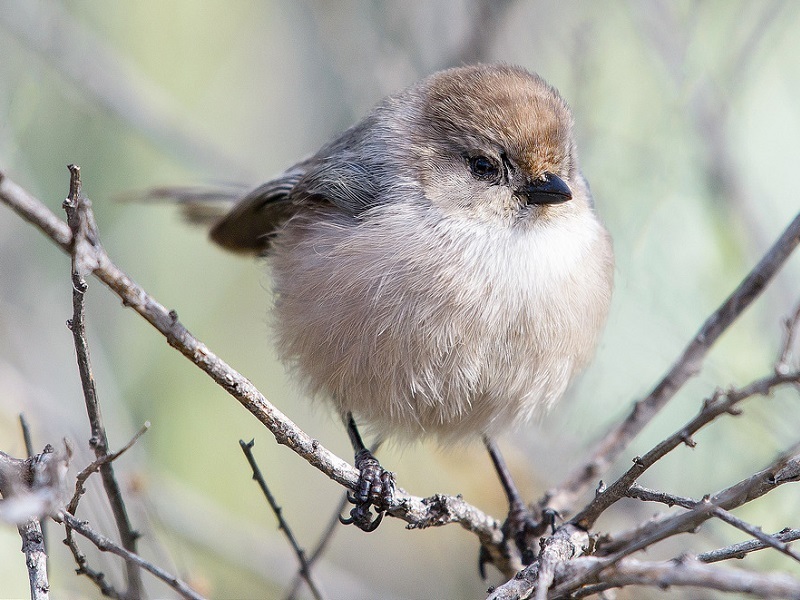 Bushtits are fairly plain brown-and-gray birds. Slightly darker above than below, they have brown-gray heads, gray wings, and tan-gray underparts. Some males have contrasting blackish face masks. Diet and behavioral habits: A common year round resident to Balboa park, these birds can be found near oaks, evergreen woodlands, and dry scrublands. Their diet consists of tiny insects, especially leafhoppers, treehoppers, aphids, scale insects, caterpillars, and beetles, as well as, wasps, ants, and the eggs and pupae of many insects. They also may eat some spiders, berries, and sometimes seeds. Nesting habits: The Bushtit Nest site is in a tree or shrub, 8-35' above the ground, sometimes lower or higher. Nest (built by both sexes) is attached to twigs and branches, a tightly woven hanging pocket, up to a foot long, with an entrance near the top that leads to a narrow passage which opens into nest chamber. Nest is made of spider webs, moss, grass, lichens, leaves, rootlets, and twigs, and lined with plant down, animal hair, and feathers. Description: Wrentits are small birds with fairly large, round heads and short rounded wings giving them an overall plump appearance. They have long legs and long tails, which they often hold up and away from their body at different angles. Their bills are short and slightly curved. 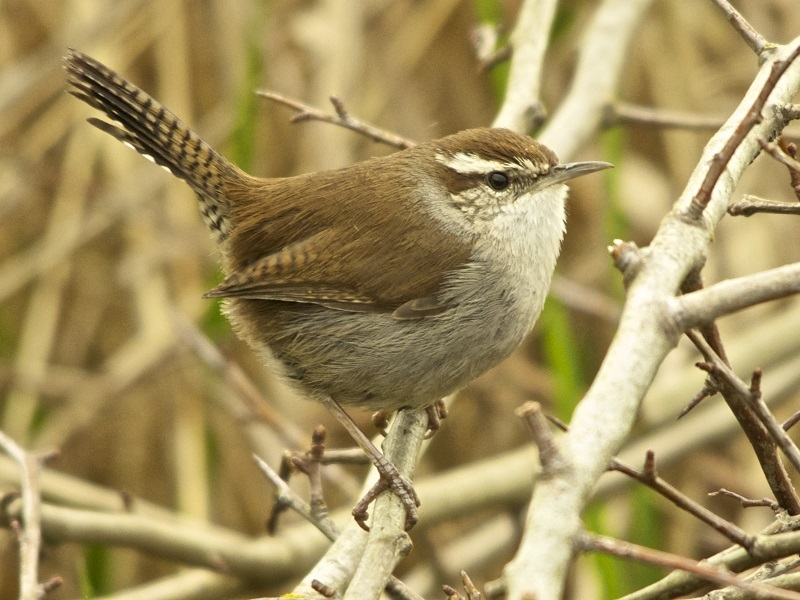 Wrentits are plain brownish-gray with paler, slightly streaked, pale pinkish bellies. They have a distinctive pale eye. 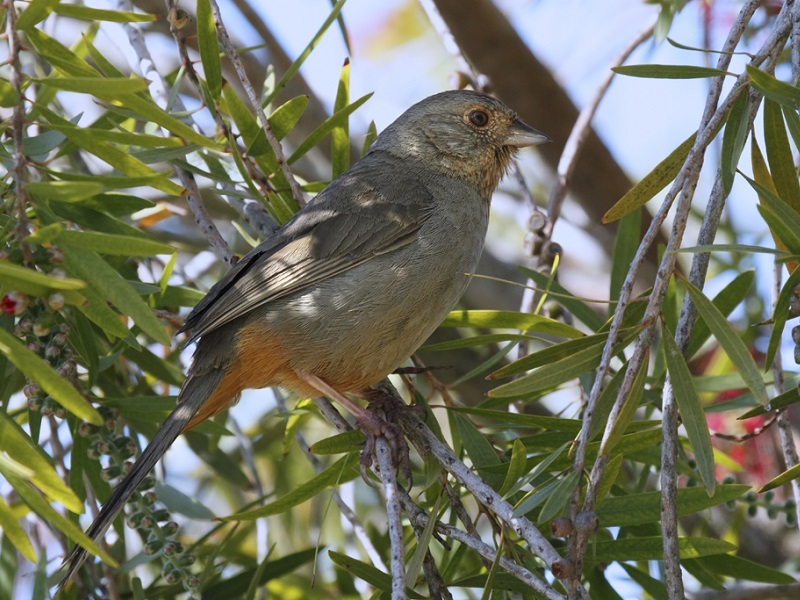 Diet and behavioral habits: This bird is fairly common year-round, living in coastal scrub and sage scrub in the canyons of Balboa Park. Wrentits feed heavily on insects, especially in spring and summer, including ants, small wasps, caterpillars, beetles, scale insects, leafhoppers, and others, plus spiders. They also eat many berries, especially in fall and winter, including those of poison oak. Nesting habits: The nest is usually well hidden by foliage in a dense low shrub, usually 1-4' above the ground, rarely above 10' in small tree. Firmly lashed into place, attached to clusters of twigs or built in fork of branch. Nest (built by both sexes) is a neatly constructed, compact cup, typically made of strips of bark and spiderwebs, lined with fine plant fibers and sometimes animal hair. Outside of nest may be decorated with bits of lichen. Description: Horned Larks are small, long-bodied songbirds that usually adopt a horizontal posture. They have short, thin bills, short necks, and rounded heads—the shape sometimes broken by two small “horns” of feathers sticking up toward the back of the head. 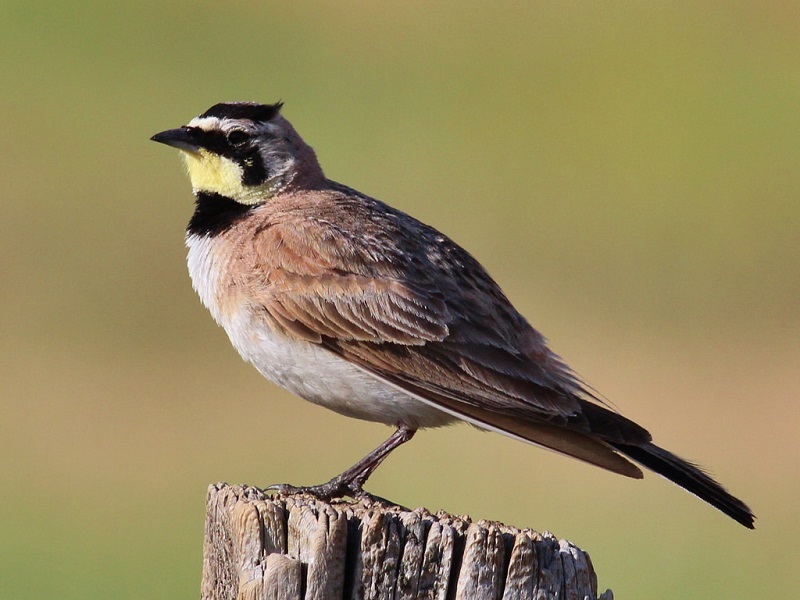 Male Horned Larks are sandy to rusty brown above, with a black chest band, a curving black mask, and head stripes that extend to the back of the head. The face and throat are either yellow or white and the underparts are white. Females have similar head and breast patterns but are less crisply defined. Nesting habits: The Horned Lark nest is built in early winter on open ground, often next to grass clump, or other object. The nest (built by female) is slight depression in ground, lined with grass, weeds, rootlets, with inner lining of fine grass or plant down. One side of nest often has flat "doorstep" of pebbles. Description: House Sparrows are chunkier, fuller in the chest, with a larger, rounded head, shorter tail, and stouter bill than most American sparrows, Male House Sparrows are brightly colored birds with gray heads, white cheeks, a black bib, and rufous neck. Females are a plain buffy-brown overall with dingy gray-brown underparts. Their backs are noticeably striped with buff, black, and brown. Diet and behavioral habits: A year-round resident to Balboa Park, and even though the overall population has dwindled, the numbers in the area still remain substantial. In most situations, great majority of diet is weed and grass seeds or waste grain. They have also been known to eat some insects, especially in summer, and they will also scavenge for crumbs of food left by humans. Nesting habits: The House Sparrow nest is usually in an enclosed niche such as cavity in tree, hole in building, rain gutter, birdhouse, nests of other birds. Where such sites are scarce, will nest in open in tree branches. The nest, (built by both parents), is made of material such as grass, weeds, twigs, trash, often lined with feathers. Inside enclosed space, material forms foundation; in open sites, nest is a globular mass with entrance on side. Description: Lesser Goldfinches are tiny, stub-billed songbirds with long, pointed wings, and notched tails. Males are bright yellow below with a glossy black cap and white patches in the wings; their backs can be glossy black or dull green. They have a black tail with large, white corners. Females and immatures have olive backs, dull yellow underparts, and black wings marked by two whitish wingbars. Nesting habits: The nest is usually placed in vertical fork of twigs in shrub or tree, 5-30' above the ground, sometimes higher in tree or very low in bushes or dense weeds. Nest (built mostly or entirely by female) is a compact open cup woven of grass, plant fibers, and strips of bark, lined with plant down. Description: House Finches are small-bodied finches with fairly large beaks and somewhat long, flat heads. The wings are short, making the tail seem long by comparison. Adult males are rosy red around the face and upper breast, with streaky brown back, belly and tail. In flight, the red rump is conspicuous. Adult females aren’t red; they are plain grayish-brown with thick, blurry streaks and an indistinctly marked face. Diet and behavioral habits: Common in Balboa Park year-round, House Finches are gregarious birds that collect at feeders or perch high in nearby trees. When they’re not at feeders, they feed on the ground, on weed stalks, or in trees. Almost all of their diet is vegetable matter, mostly weed seeds, and buds and flower parts in spring, berries and small fruits in late summer and fall. They will also eats a few insects, mostly small ones such as aphids. 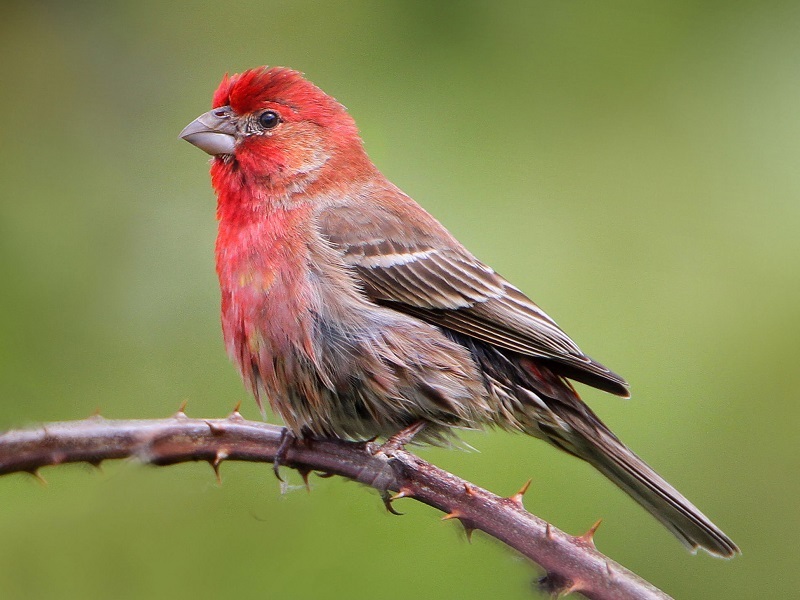 Nesting habits: House Finches use a wide variety of sites for their nest, especially in conifers, palms, ivy on buildings, cactus, holes in man-made structures, averaging about 12-15' above the ground. They use sites such as hanging planters, and old nests of other birds. The nest (built mostly by the female) is open an cup of grass, weeds, fine twigs, leaves, rootlets, sometimes with feathers, string, or other debris added. Description: Song Sparrows are medium-sized and fairly bulky sparrows. 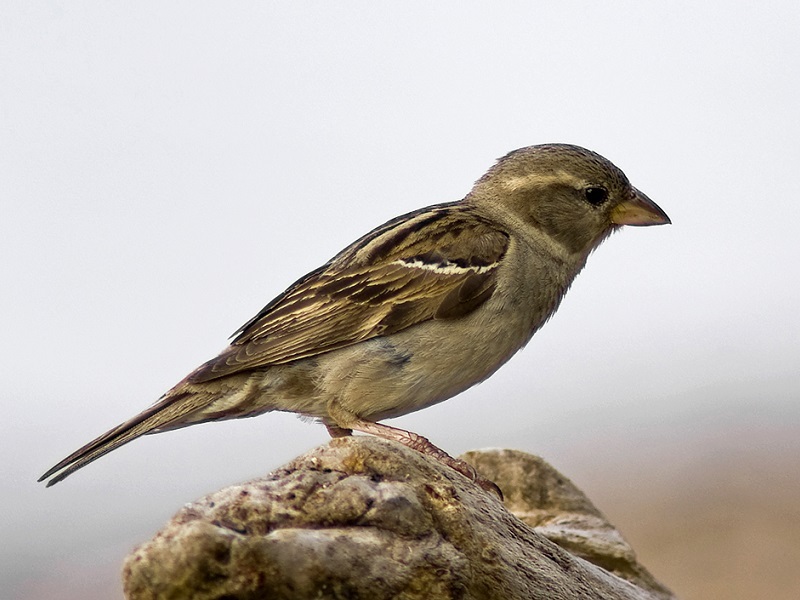 For a sparrow, the bill is short and stout and the head fairly rounded. 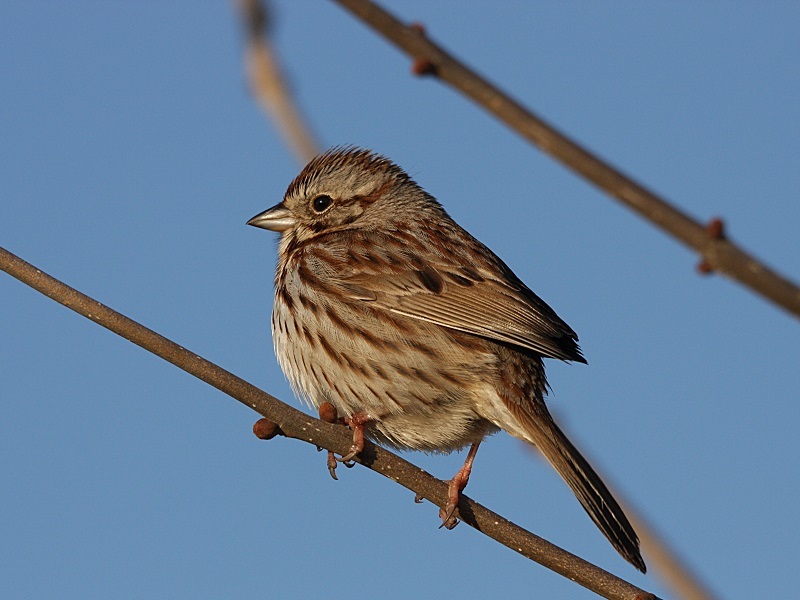 The tail is long and rounded, and the wings are broad, Song Sparrows are streaky and brown with thick streaks on a white chest and flanks. On a closer look, the head is an attractive mix of warm red-brown and slate gray. Diet and behavioral habits: These birds are common year-round, and their numbers have increased in Balboa Park over the last 40 years. Their diet consists of many insects, especially in summer, including beetles, grasshoppers, caterpillars, ants, wasps, and spiders. In the winter, they feed heavily on seeds of grasses and weeds. Nesting habits: Nest site varies, usually on ground under clump of grass or shrub, or less than 4' above the ground, sometimes up to 10' or higher. Raised sites may be in shrubs, low trees, or marsh vegetation, often above water. Rarely nests in cavities in trees. Nest (built mostly or entirely by female) is an open cup of weeds, grass, leaves, and strips of bark, lined with fine grass, rootlets, and animal hair. Description: California Towhees are essentially large sparrows, with a sparrow’s short, rounded wings, long tail, and thick, seed-cracking beak – but towhees are larger and bulkier. The long tail and short wings can give this bird an ungainly look in flight. 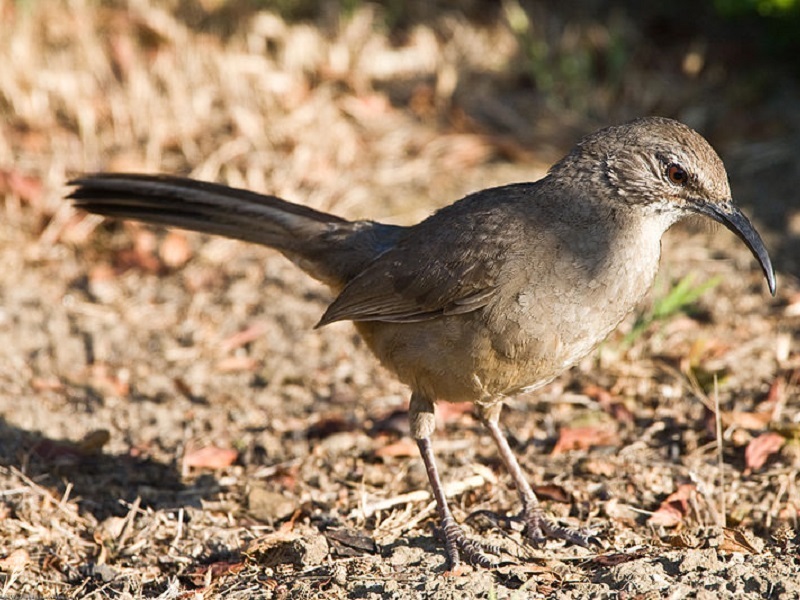 Few birds are as uniformly matte brown as a California Towhee, except for a rusty patch under the tail and around their bill. Males look the same as females. Nesting habits: Nest site is usually in a dense shrub or low tree, typically 4-12' above the ground, but may be very low (sometimes on the ground) or up to 30' or higher. Nest is a bulky open cup, rather loosely made of twigs, grass, weeds, and strips of bark, lined with finer grass, rootlets, and animal hair. 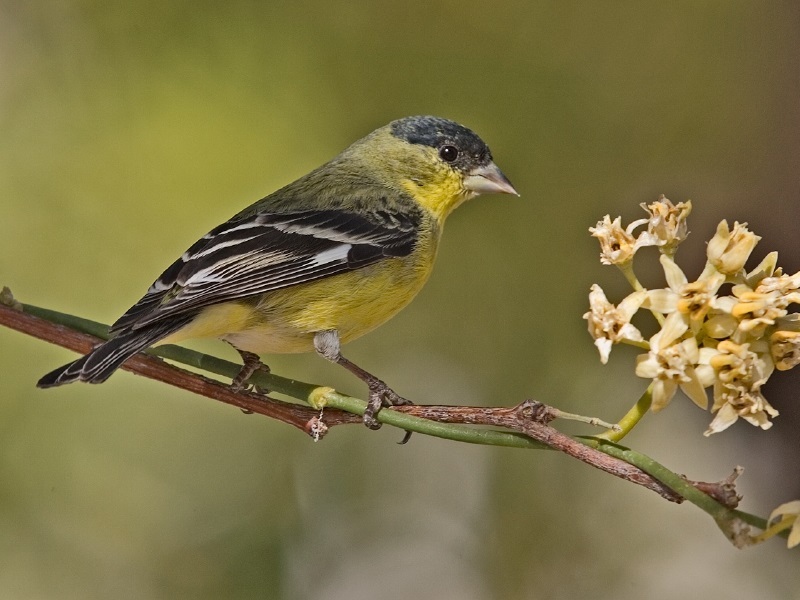 Description: Hooded Orioles are fairly large songbirds with longer and more delicate bodies than other orioles. They also have long rounded tails and longish necks and the bill is curved slightly downward. Adult males are brilliant black and vary from brilliant yellow to flame orange. They have black tails, throats, and wings and yellow to orange rumps, hoods, and bellies. The black throat extends up the face like a little mask around the eye and down the chest to make a bib. Adult males flash white wingbars. Females are olive-yellow overall with grayer backs and white wingbars. Juvenile males look like females, but with black throats. 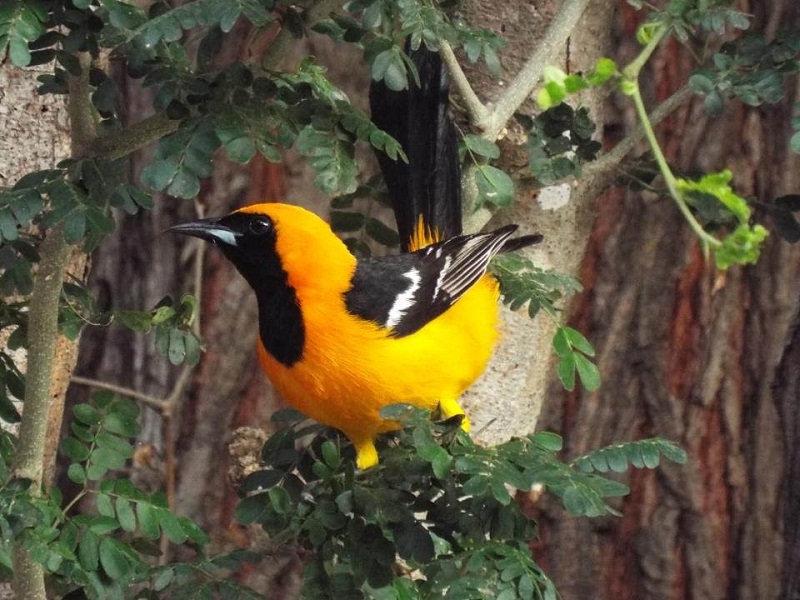 Diet and behavioral habits: One of Balboa Parks common summer residents, Hooded Orioles live in open woodlands with scattered trees, especially palm trees. Hooded Orioles are acrobatic foragers and often hang upside down while they grab their prey, but they tend to forage sluggishly among leaves and branches. Their diet includes berries, nectar, and insects, like caterpillars, beetles, wasps, ants, and many others. Nesting behaviors: The Hooded Oriole nest is often placed in palm or large yucca, sewn to underside of large overhanging leaf; usually 10-50' above ground, but can be lower. Sometimes placed under banana leaf, in clump of mistletoe or Spanish moss, or suspended from branch of deciduous tree. Nest is a woven hanging pouch of grass and plant fibers, lined with plant down, hair, feathers. The female builds the nest, but the male may help bring material. We hope you have enjoyed learning about some of Balboa Park's feathered friends. This Itinerary has been brought to you by Friends of Balboa Park, with contributions by SDG&E, Balboa Park Online Collaborative, The City of San Diego Department of Parks and Recreation, San Diego National History Museum, and Monarch School.